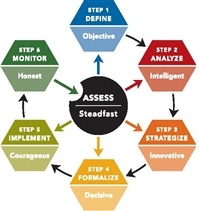 Central to this process is the need to assess performance on an ongoing basis, and to make necessary adjustments. Each step is then further defined/refined by decision-making dimensions. Our value is realized as you begin to experience the improved sense of financial well-being knowing you have carefully considered all of your options to achieve your life goals. Financial Well Wealth Management Service is comprised of institutional investing from a fiduciary due diligence and financial planning perspective. The service is designed to help you determine how closely your investments are meeting your financial planning goals. Whether you need access to institutional brokerage services or trust services, the Financial Well Wealth Management Team is able to offer a wide range of options with full transparency. Measuring returns is not enough. The risk of each investment vehicle or strategy should be considered. Using the disciplined approach of a fiduciary with the required principles of diversification, we manage your financial resources with you to determine your investment objectives, risk profile, investment time horizon, income needs and tax sensitivity. This process drives your investment policy that establishes your targeted returns, asset allocation, manager selection, and re-balancing strategy. The ongoing review of your investment assets and their performance ascertains whether you are reaching your financial planning goals as well as your investment goals. You will have an opportunity to meet with The Financial Well at least quarterly to discuss your portfolio and to share with our team any issues you have about the portfolio's performance or your financial well-being. The Financial Well Wealth Planning Service is a fee only retainer relationship service designed to provide you with a financial "physical" that outlines your financial well-being and road map to help you achieve your financial goals and objectives. Financial planning is a process that focuses on your life goals and resources, evaluating your whole financial picture and then outlining strategies that are tailored to your financial well-being and needs. A comprehensive financial plan serves as a framework for organizing the pieces of your financial life and well-being. With the Financial Well Wealth Planning Service, you'll be better able to focus on your goals and understand what it will take to reach them. The Financial Well Wealth Planning Team becomes your objective and unbiased resource for financial well-being. One of the main benefits of having a financial plan is that it can help you balance competing financial priorities. The Financial Well Wealth Planning Team will help you clearly see how your financial goals are related. We help you prioritize your goals, implement specific strategies, and choose suitable resources, products or services. Best of all, you'll have the peace of mind that comes from knowing that your financial life and well-being is on track. We go through the following process with you. Gather Information - We assess your current situation and the unique facets of your financial life. Define Goals - Together, we identify your goals and time frames. Analyze Data - We create a detailed financial picture of what resources and tools you have in place. Create a Plan - We design a personalized Financial Well Wealth Plan that addresses issues such as retirement, estate, risk management, tax, education, and investment strategies. Implement the Plan - We prioritize your "to do" list and work with you and other professionals to implement your financial plan. Review & Update your Plan - We review your Financial Well Wealth Plan to make adjustments as your life, goals and financial well-being change. We focus on your financial well-being issues as a compliment to the Financial Well Wealth Management Service that focuses directly on your investment assets.